My name Melia comes from a very long middle name “Puameliaaala.” It is a family tradition to give each child a Hawaiian middle name since my dad is half Hawaiian and Italian. My siblings and I have carried that tradition down to our children. Names are very important to Hawaiians. It is believed that one becomes the meaning of their name. Melia is the plumeria flower found in most leis in Hawaii and in the trees all over the island. The entire meaning of the pua and aala is the fragrant smell of the flower. Now, I love the new movie Maona except for the fact that Maona’s little pig friend’s name is Pua! What?! I am no stinky pig but a sweet smelling flower! I was laughing when I heard her call her pig “Pua.” Maybe that means pig in another island language. How sad for me! If you are not Polynesian or familiar with the different cultures of the islands you might have missed a few of the different parts that highlighted a Polynesian island. I laughed while my 4 year old cried when the coconuts turned into pirates. I remember that my dad had a bank or something similar made out of a coconut with a face on it. The highlight of the movie for me was the fantastic music. I have always been a fan of Te Vaka when I first heard them sing in the movie called “The Legend of Johnny Lingo.” The leader of the group for Te Vaka is a very talented musician named Opetaia Foa’i. After we watched the movie, my daughter and I were in love with the music. You would find us many times watching the songs on YouTube and singing our hearts out. During one of our date nights, my daughter and I grabbed a slush from Sonic, sat under a tree and sang all the songs we knew from Moana. My favorite song is the voyager song called “We Know the Way.” You can read a bit about the behind-the-scenes in making this song from the song writer Opetaia here. I can listen to this song hundreds of times and not get tired of it. There is a part right after this song where Moana’s Grandmother makes a profound statement. She said, “We have forgotten who we are.” It pierced my heart as I realized how often that happens. If we do not continue to tell the stories of our ancestors, we too will forget who we are. It was so important anciently to preserve the records of the people, that many left everything behind to preserve their records. Many even sacrificed their own lives to preserve their history, language and religion. Today, I encourage you to find out who your ancestors were. Did they live off the land as a farmer, or lived in a mining village like my Italian relatives. Did they climb coconut trees, sing songs on the ukulele and give their life on the battlefields of North Korea like one of mine did? Whatever their stories are, do not forget them. We are who we are today because of those that have gone before us. 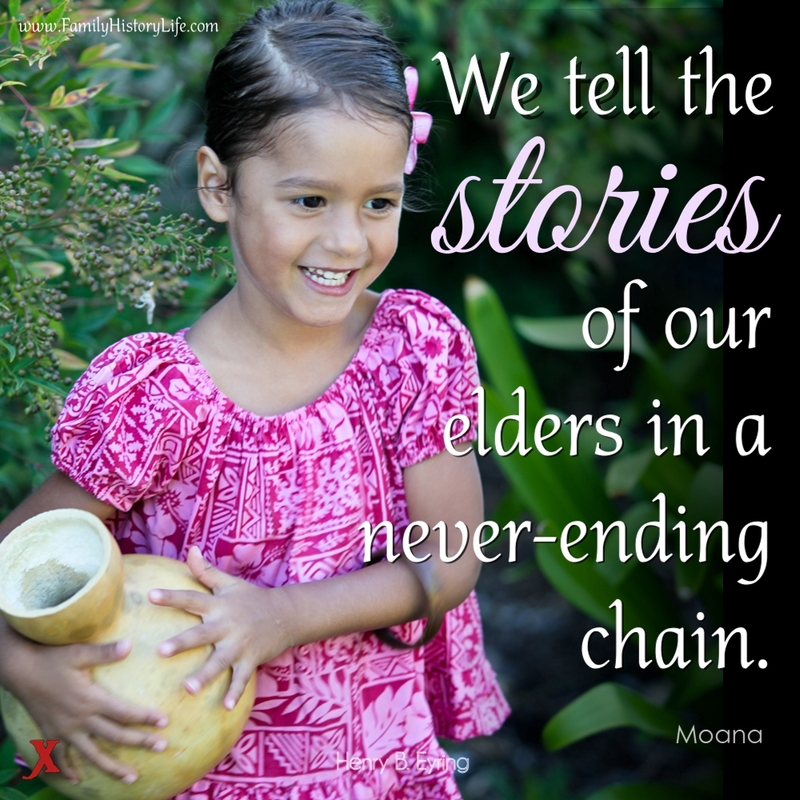 As quoted in the song, “We tell the stories of our elders in a never-ending chain.” (“We Know the Way, Moana) Don’t be the weak link in your family chain, join us today here at a Family History Life as we explore and find our ancestors. Take the first step today and start here.